Introducing extra Certificates of Record for multi-kid families and those rigorous recordkeepers. 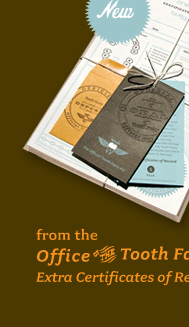 File detailed notes with your local Tooth Fairy for every tooth lost. Official policy requires only one tooth remain on file for each child. However, by popular demand from those diligent recordkeepers at our field offices – your local Tooth Fairy can collect up to 20 certificates for a full set. And multi-kid familes can get a certificate for each child to use with your original Deposit Bag.